As much as I like to think that spring is coming, we’ve got a little bit more cold weather to get through before it’s time to start shedding layers. Admittedly, California doesn’t get very cold, but my skin is already hopelessly dry on the best of days, so a slight temperature drop could turn things near-reptilian. 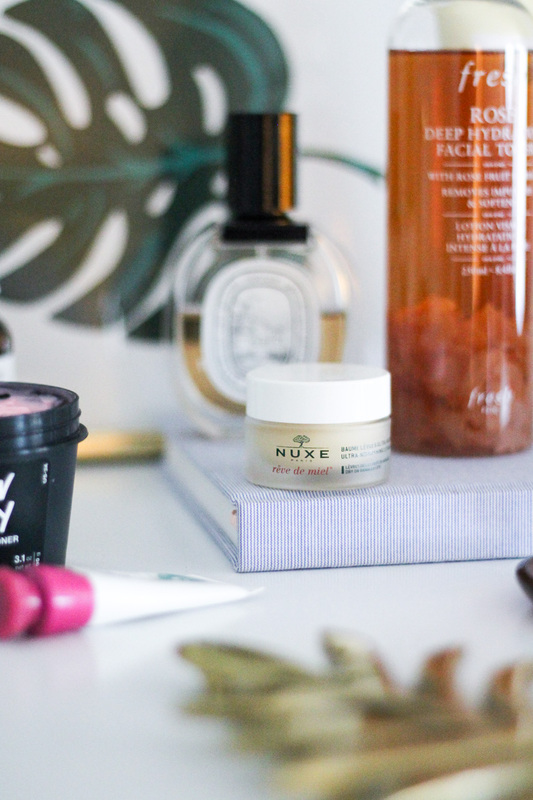 This wintery edit has been my tried and true for soothing my dry face and limbs over the past few months. Nuxe Rêve de Miel Lip Balm: I like to keep this lip balm on my bedside table and apply it every night just before bed. Because the first two ingredients are beeswax and shea butter, I find this formula a lot more nourishing than vaseline-based products. I'm on my second pot of this stuff! 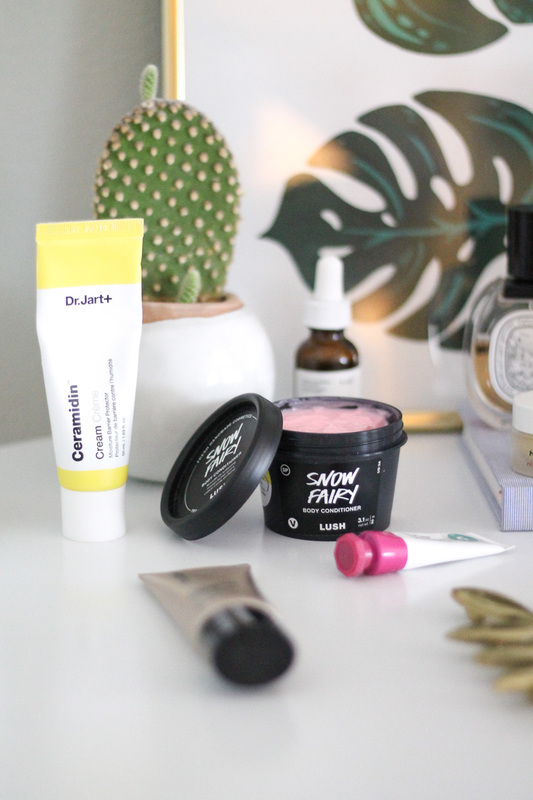 Dr. Jart+ Ceramidin Cream & Dr. Jart+ Ceramidin Body Cream: As I've established, face and body lotions are a must all year long for me, but these thick moisture-sealing ceramidin creams are my absolute favorites. I wrote a full post about my review of these last week. Lush Snow Fairy Body Conditioner: If lotion just isn’t enough hydration for you, Lush has some in-shower moisturizers that you apply and wash off right before getting out of the shower. The Snow Fairy scent is a Christmas-exclusive that I picked it up during the BOGO sale, but the Ro’s Argan Body Conditioner is just as great. Bare Minerals Complexion Rescue: This tinted moisturizer is one of my all-time favorites because it provides just enough coverage without feeling noticeable on my skin. I picked up the shade Vanilla 02 to match my winter complexion. Glossier Cloud Paint (Haze): I always love to use the Cloud Paints, and Dusk is usually my go-to color, but throughout December I noticed myself reaching for Haze more often. The deeper color almost gives you that just got in from the cold, rosy cheeks look. Diptyque Eau Duelle: This has been my go-to fragrance every winter since I recieved it as a Christmas present a few years ago. It is a gorgeous mix of vanilla and spice that I almost want to wear all year round. Fresh Rose Deep Hydration Facial Toner: I have to say I’m still trying this product out. It’s beautiful to look at and enjoyable to use, but so far I just don’t notice much of a difference when I use this product. I think toner overall is a thankless product though in that you don’t see much direct payoff from them. The Body Shop Honey Bronzer: As much as it pains me, switching over to a lighter bronzer is always a good idea in the winter months. I want to look healthy, but not fake. If you can’t find the Body Shop one (I think they're discontinuing it) I would also recommend Benefit’s Hoola Lite. The Ordinary Marula Oil: At first I was a little skeptical of how much I liked this face oil, which I even said in my The Ordinary First Impressions post. After giving it a solid try I actually do enjoy using this at night when my skin is feeling extra dehydrated.